There is a new kind of dad, and he’s doing far more domestic duty than at any time in history, including cooking. Although it’s written with a sense of humor, this book is a serious resource for dads and anyone else interested in upping their game to make great tasting food at home, even if they have never used a chef’s knife or a roasting pan before. 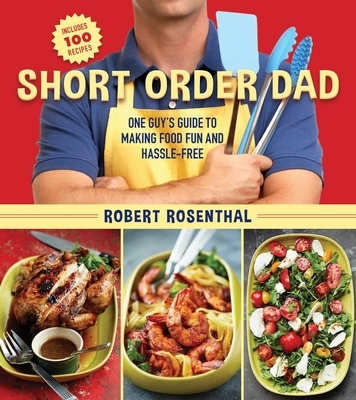 Author Robert Rosenthal teaches basic techniques and presents a playbook of simple recipes that achieve the most taste with the fewest ingredients and the least effort.™ The dishes are sophisticated enough for entertaining, yet family table tested as well. Short Order Dad covers all the essentials, from shopping ingredients and cooking tools to appetizers, soups and salads, snacks, entrees, sauces and dressings, sides, desserts, cocktails and more, to make anyone a successful chef. Good cooking doesn’t have to be complicated to be great. In fact, it’s just the opposite. So whether you’re clueless in the kitchen, pan-fry phobic, or already a skilled cook, Short Order Dad is here to help turn your kitchen into a place to play. Robert Rosenthal presented creative ideas around the world as an award-winning international advertising executive, performed his standup routine in NYC’s top comedy clubs, and earned a professional cooking degree from the prestigious Institute of Culinary Education. Ad Age calls him, undoubtedly one of the industry’s most colorful characters.” He has hosted hundreds of fun food segments on TV stations across the country and his columns appear regularly in the Huffington Post. His video program runs weekly on food and drink mega-site The Daily Meal, where he is the resident food humorist.” Rosenthal is the personal chef to his wife and kids, who named him Short Order Dad. "[An] inspirational book that will tickle your taste buds as well as broaden [your] view of what cooking is and what it is not."